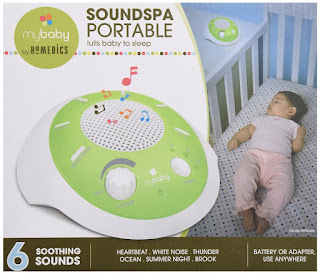 What do you think of this myBaby SoundSpa? Mybaby Soundspa creates a comforting environment, with six nature sounds to choose from heartbeat, white noise, ocean, summer night, thunderstorm and brook. The portable version is perfect for the new mother or traveler. The auto-off timer makes the Soundspa portable not just easy to take with you, but easy to use. BONUS QUESTION! Who has the best price? Today it is definitely the US Amazon site - plus it's discounted by 22% off!